“Cop Car.” Simple title for a simply terrific new indie from Jon Watts, heretofore known for a gruesome cult item about a father who dons a party clown suit that doesn’t want to come off. Sounds like a predicament straight out of Stephen King, no? Kevin Bacon in aviator shades and twitchy mustache plays the villain, a Colorado sheriff. The character is purposely overdrawn, like a Looney Tunes version of Robert Mitchum in “Night of the Hunter.” At times, when things don’t go his way, you half expect Bacon to turn fire-engine red and emit smoke from his ears. James Freedson-Jackson and Hays Wellford play the temperamentally opposite 10-year-olds who, for reasons never explored, have run away from home. During their desultory ramble they happen upon a squad car in a ravine. When it’s determined the car is unattended, they do what most rebellious adolescents would do — go for a spin. What they don’t know is that the car belongs to a killer cop, even now in the process of disposing of a body. 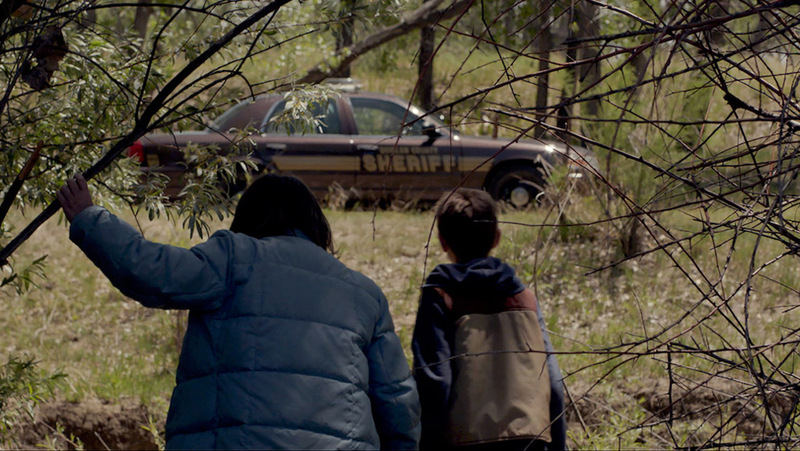 “Cop Car,” available through VOD, does a remarkable job of sustaining the kids’ perspective. Watts, like Rob Reiner with “Stand by Me,” hasn’t lost track of his inner child. The mouthy Travis and moody, easily swayed Harrison talk and interact like kids, forever attempting to one-up one another. Every other exchange begins with an “I dare you!” They’re ruled by kid-logic (thrown dirt clods must be retrieved because they have thrower’s fingerprints). These kids are pretty savvy for their age. Indeed, they’re soon zigzagging down the highway, playing with the backseat firearms. They may even be fitting adversaries for Bacon’s demented Barney Fife. Even so, Watts never lets us forget they’re still kids. Which makes some of their trial-and-error experiments especially wince-worthy. If the voice on the police scanner sounds familiar, here’s why: It belongs to Kyra Sedgwick, who, of course, is executive producer-star Bacon’s real-life wife. Quirky, assured and unexpected, “Cop Car,” co-written with Christopher D. Ford, is the perfect calling card for Watts, who, not surprisingly, has been tapped to replace Sam Raimi on the next Spider-Man movie.